Cancer is the focus of intense clinical and scientific interest. This research increasingly leverages our understanding of molecular biology for the development of targeted therapeutics. 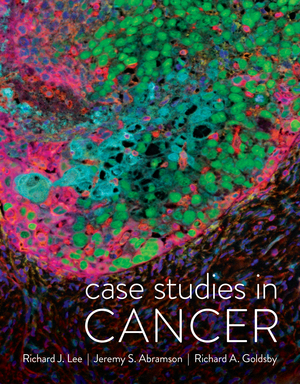 Well-selected case studies provide an opportunity to explain specific examples of cancers and their management in the context of engaging, patient-centered cases. This text is a clinical companion for Weinberg’s The Biology of Cancer. However, it includes sufficient background and explanatory detail to be used on its own. The modern diagnosis and treatment of cancer is intricately tied to the molecular underpinnings of disease. Case Studies in Cancer highlights the broad range of malignancies in which known molecular pathways contribute to tumorigenesis as well as susceptibility or resistance to therapy. Every case highlights the relationship between the underlying molecular biology and the disease diagnosis and treatment. A logical, consistent organization of the cases ensures that the translation from “bench to bedside” is always apparent to the reader. As a clinical complement for The Biology of Cancer, this text gives exposure to the broad biological and clinical spectrum of cancer. It’s aimed at advanced undergraduates, basic science graduate students, and researchers who may not otherwise get exposure to the diagnosis and treatment of cancer in patient-centered contexts. First and second year medical students will benefit from the “bench to bedside” approach to better understand the biological rationale behind current treatments.